What could be better than a succulent beef stew with a hint of stout beer? Hint: There are two tricks for a tender stew. First, buy meat with generous marbling (tiny bits of fat between the muscle fibres). Second, cook it over low heat for several hours. Set a Dutch oven over medium-high heat, add oil and heat to smoking point. Working in batches, brown beef cubes on all sides. Transfer cooked beef to a plate and keep warm. Reduce heat to medium-low, add onions and brown sugar and cook until golden, about 10 minutes, stirring occasionally, then stir in garlic and cook 1 minute more. Increase heat to medium-high, add butter and, once melted, sprinkle in flour and cook until flour has been incorporated, about 2 minutes, stirring constantly. 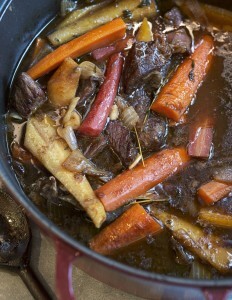 Stir in stout and stock add, using a wooden spoon, scrape up any browned bits stuck to the bottom of the pot. Add back in reserved beef and any accumulated juices and bring mixture to a boil, then reduce temperature to medium-low, add parsnips, carrots, thyme and bay leaves, cover, and simmer until beef is tender, about 30 minutes, stirring occasionally. Uncover pot and continue to simmer stew until cooking liquid is thick enough to coat the back of a spoon, 15 minutes more. Let stew rest off the heat for 5 minutes, then remove thyme sprigs and bay leaves, season to taste with salt and pepper and serve immediately.